What is Hawaii’s maritime heritage? The maritime heritage of Hawaii begins when the islands were first settled by Polynesian voyagers perhaps as early as 1,700 years ago. Native Hawaiians depended upon maritime resources, used outrigger canoes to fish and maneuver along Hawaii’s high energy, rocky coastline, and developed a complex system of fishponds and fishing shrines. After the islands were recorded by Europeans in 1778, there was an influx of settlers, traders, and whalers. The focus of the economy changed over time from fishing to the sandalwood trade and whaling to the export of sugar and agricultural goods. Today, the waters of Hawaii are dominated by cargo ships, commercial fishing vessels, and recreational boats. The United States Navy took an interest in the Hawaiian Islands as early as the 1820s, began permanently stationing ships at Pearl Harbor and claimed Midway Island in the 1860s, and leased lands for a navy base in the 1880s. Pearl Harbor Naval Shipyard was established in 1908. There are all kinds of sites dating from the 1800s, if not earlier, to the present in the waters of the Hawaiian Archipelago. Two of the oldest documented sites are the British whaling ships Hermes and the Pearl that ran aground on an uncharted and submerged reef, now called Pearl and Hermes Atoll, in the Northwestern Hawaiian Islands in 1822. Nearby are the remains of a modern fiberglass ship thought to be the Mimi that ran aground the same reef in 1989. At Kure Atoll, the highest point of which is a few feet above sea level, several sites have been documented including the whaling ship Parker that crashed into the reef in 1842, the USS Saginaw that wrecked in 1870 while trying to rescue another shipwrecked crew, and the Dunnottar Castle that wrecked in 1886 with a cargo of coal. Off the island of Hawai‘i, the sites of two steamboats and one Hawaiian sampan have been documented. At the turn of the 20th century, steamboats came into use for inter-island transport of cargo, passengers, sugar, and cattle. About the same time, the Hawaiian sampan was introduced for use in the tuna fishing industry. The wooden-hulled SS Kauai was lost off Mahukona Port in 1913 and the iron-hulled SS Maui wrecked on a reef at Makalawena in 1917. The sampan Fuji Maru, which had been purchased by the United States Navy and converted to patrol vessel YP-183, grounded in Mahaiula Bay in 1943. Some of the most well known wreck sites in Hawaiian waters are warships and sunken aircraft from World War II including the USS Arizona, the USS Utah, and two Japanese midget submarines in or near Pearl Harbor; and American and Japanese losses in the Battle of Midway. Who takes care of Hawaii's underwater archeological sites? The Department of Land and Natural Resources has overall responsibility for historic properties on state lands and under state waters. The Department accomplishes this work through its Historic Preservation Division and its branches of History and Culture, Archaeology, and Architecture. The Division maintains an inventory of Hawaii’s known historic properties, reviews development projects that may affect the state’s historic properties, and is responsible for the state’s comprehensive historic preservation program. The National Oceanic and Atmospheric Administration, in cooperation with the State of Hawaii, the Naval History and Heritage Command, the U.S. Fish and Wildlife Service, and others, undertakes expeditions in the Northwestern Hawaiian Islands to search for, locate, and document shipwreck sites in Hawaii’s waters. Sunken warships, naval auxiliaries, military aircraft, and other vessels owned or operated by a sovereign on military noncommercial service when it sank remain the property of the sovereign unless formally abandoned or ownership rights relinquished pursuant to a treaty or agreement. 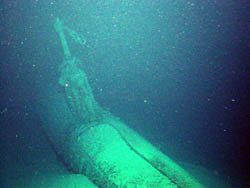 The United States Navy continues to own its sunken vessels in Hawaiian waters and at Midway Atoll. The wrecks of the USS Arizona and the USS Utah in Pearl Harbor are managed by the National Park Service under an agreement with the United States Navy. The Government of Japan continues to own its sunken vessels in Hawaiian waters and at Midway Atoll except for two submarines near Pearl Harbor, now the property of the United States Government, pursuant to an exchange of diplomatic notes. You need a permit from the Department of Land and Natural Resources to conduct work at archeological sites on state lands or under state waters in Hawaii. Depending on the nature of the work, additional permits may be needed from the U.S. Army Corps of Engineers, the Hawaii Coastal Zone Management Program, and other federal, state, and local government agencies. Applicants must have a professionally qualified principal investigator, submit a research plan, complete a report, and reach agreement on curation of recovered objects, which are the property of the state of Hawaii. 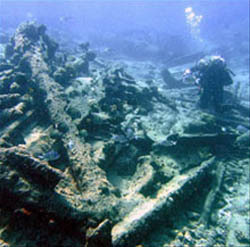 What laws concern underwater archeology in Hawaii? The State of Hawaii considers its historic and cultural heritage to be one of its most important assets, and sponsors its comprehensive program of historic preservation to promote the use and conservation of its heritage for the benefit of its citizens. Section 6E-1 et seq., in Part I of Chapter 6E of the Hawaii Revised Statutes establishes the state’s Historic Preservation Program. The Program’s regulations are in Title 13 of the Hawaii Administrative Rules, in Subtitle 8 relating to the Historic Places Review Board (Chapter 197) and the National Register of Historic Places (Chapter 198) and Subtitle 13 relating to Burial Sites and Human Remains (Chapter 300) and Review for Governmental Projects (Chapter 275-284).